Living in Denver for the last 11 years and Boulder before that, Michael Schultz and his girlfriend Mia know the Coloradans have a reputation for enjoying all-season outdoor activities. If anything, the cold's has been good for Schultz's side hustle as a "Bird hunter" or "Lime juicer," as the gig economy chargers for the two biggest scooter companies are called. "The competition has thinned out a lot because a lot of the chargers are fair-weather chargers," says Schultz. "It's actually making it easier for me." Scooter operators such as Lime, Bird, Skip, Spin, Lyft, and Jump all have plans to continue to deploy scooters where they can, weather-permitting. The companies all have plans to monitor for cold temperatures, icy conditions, and snowfall, to pause service or remove scooters from the roads. It's all a little vague, with promises to assess each day on a case-by-case basis, with local teams responding to the weather accordingly. How to ride north shore style trails. Cycling bibs vs shorts, refreshed for modern engineered shorts ? Cycling: wear bibs-vs-shorts, refreshed for modern engineered shorts ? Bibs are like shorts with builtin suspenders. Cycling Magazine on Traversee du lac Saint Jean, the ultimate-canadian-winter-cycling-adventure. Dedicated to mobilising complex mobility data, Ito World, have launched a global bike sharing data feed - the first product that provides a commercially available, global bike-sharing data set as a single feed. Audax is a cycling sport in which participants attempt to cycle long distances within a pre-defined time limit. Audax is a non-competitive sport: success in an event is measured by its completion. Audax has its origins in Italian endurance sports of the late nineteenth century, and the rules were formalised in France in the early twentieth century. 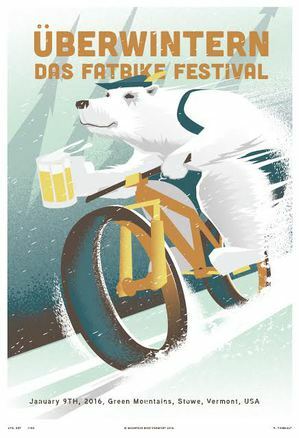 In the present day, there are two forms of Audax: the original group-riding style, Euraudax, governed by Unions des Audax, and the free-paced (allure libre) style usually known as Randonneuring, governed by Audax Club Parisien. The original form is mostly popular in France, but also in the Netherlands, Belgium and Germany. Randonneuring is popular in many countries including France, Great Britain, Singapore, Australia, Canada, the USA and China. Bike Angels forCitiBike NYC bike share. Last year, billionaire Ken Griffin wrote an email to Chicago Mayor Rahm Emanuel complaining the "lakefront bike path is a disaster." It wasn't an idle complaint. This week, workers are finishing the first stages of a $12 million, 18-mile face-lift of the path along Lake Michigan, courtesy of a check from Mr. Griffin, the founder of hedge fund Citadel LLC. The new path will separate bike and jogging traffic, making a safer experience for everyone, including Mr. Griffin, an avid biker himself. In Arkansas, the Walton Family Foundation, run by the family of Wal-Mart founders, has invested at least $15 million in bicycle-trail development. In Philadelphia, the Haas family, through the William Penn Foundation, has donated about $40 million for bike infrastructure in recent years. And in Carrollton, Ga., Laura Richards, founder of Carrollton Greenbelt LLC, gave about $12 million to help fund an 18-mile bike path in and around her hometown. Portable Pressure Washer with a High-Pressure Hose, the Mobi V-17 Portable Bike Pressure Washer comes with many features, such as a 17 litre water tank and adjustable spray gun, which is attached to a high-pressure hose, reviewed. Rides, when, where. Citibike shares bikeshare data for NYC. Alliana Semjen, 25, a marketing manager at NBC, and her boyfriend Matthew Schwartz, 27, a lawyer, came to watch the race in matching cycling gear. Two to three times a week, they say their alarm wakes them at 4:30 a.m. so they can do a couple laps around Central Park before work. As the riders went into the final stretch, a barista at Rapha placed a sign on the counter. It read, "5 km to go. No service. (Watch the race)". He has an espresso with breakfast and a glass of wine with dinner. Cutshall said he never tires of the menu, as it was designed to include "everything a human craves," he said. "There are things that are hot, cold, salty, creamy, chewy, spicy, savory, and crisp." -- Large Fella on a bike, Scott Cutshall. Specialized Roubaix 2017: best sportive bike for Gran Fondo ? The original Roubaix aimed to offer all the benefits of a racing machine, with all the stiffness, low weight and high pedalling efficiency that modern carbon fibre construction could deliver. The big difference was that this was combined with a more endurance-biased geometry. Audax-style or in American-speak 'Century' bike geometries before, where elongated head-tubes and short top-tubes met shorter angled-up stems for a very upright, more relaxed riding style. But Specialized's Roubaix wasn't as short in the top-tube or as tall at the front. It was this sweet spot that revolutionised road bike development. Now with Chis and Chris (Chris D'Alusio and Chris Yu) suspension inserts for the post-Zertz elastomer era. "A temporary "pedestrian safety fence" intended to prevent suicides will be installed starting on Sept. 25 on the south side of the George Washington Bridge, announced Monday after a tour of the span by high ranking Port Authority officials. Installation of the fence on the span's upper-level south sidewalk means it will be temporarily closed to pedestrians and bicyclists for three months, officials said. So far this year, agency "initiatives" have been credited with "intervening in 45 cases where emotionally disturbed people were considering doing themselves harm on the bridge," officials said"
Typically, road bike efficiency and bicycle suspension don't go hand in hand. But in 2012 when Trek introduced the Domane, it could be argued that it represented a revolution in road bike design. Rather than incorporating "suspension" in a traditional sense, the Domane saw the launch of Trek's IsoSpeed Decoupler which allowed certain parts of the frame to flex while others remained stiff. Shortly after, Cancellara put his stamp of approval on the concept by racing it to victory in both Flanders and Roubaix. A cyclosportive, or often simply sportive, is a short to long distance, organised, mass-participation cycling event, typically held annually. The Italian term Gran Fondo is commonly used for these events in the United States, Australia and some other English-speaking countries. Saint-Bruno-de-Montarville in Quebec: unreasonable influx of cyclists into their quiet neighbourhood ? Some of the residents of Saint-Bruno-de-Montarville in Quebec appealed to their city councilors on Monday to stop what they consider an unreasonable influx of cyclists into their quiet neighbourhood. The residents who showed up consider the club riders who come to train on the roads of their neighbourhood more than just a nuisance but an invasion of their quiet streets. They think cyclists using the neighbourhood to train are disregarding the street laws and there needs to be a greater police presence. Nicole Kirouac, who lives on Rue du Sommet-Trinité near the corner of Chemin des Hirondelles and Rue Mésange, told La Radio Allumée she feels like a hostage because of the cyclists who chose the roads of her neighbourhood to train on for hours. A popular Strava segment that goes by this intersection, a 500 m stretch of road that rises at an average gradient of 3.7 per cent, has 11,912 attempts by 1,335 users. Many of the roads in this corner of Saint-Bruno rise gently as they sit on the slopes of the Mont-Sainte-Bruno and are dead ends so they don't see very much vehicle traffic. Rapha may not be a household name, in the tribal cycling community it is seen as a "Marmite" brand, at the centre of fierce forum debates where detractors see it as the fiefdom of wealthy metrosexuals or the "Raphia". Its sells everything from £20 embrocation cream - which redirects blood back into your lower extremities by stimulating blood vessels - to bespoke holidays in the Alps. It even has its own riding club with 9,000 members paying £135 a year for perks including free coffee in its clubhouses. "We are totally in love with the sport," Mottram said in a recent Guardian interview. "We love the product and think the product should be as good as the sport. I care about how I look and perhaps that makes me a shallow person but why on a bike should you not?" 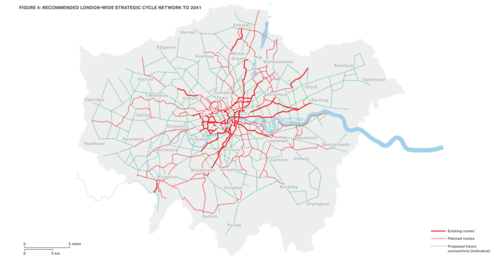 Do biking commuters breath pollution ? A New York City story. WNYC: Do biking commuters breath pollutionin NYC. The husband of cyclist Olga Cook, who was killed by a drunk driver last June at the intersection of West and Chambers Streets, is suing the City of New York, the State of New York, the Hudson River Park Trust, and the Battery Park City Authority over her death. Ms. Cook was run over at approximately 8:00 pm on the evening of June 11, 2016 when a white Ford truck, driven by a 26-year-old Samuel Silva, traveling southbound on West Street, made an abrupt right turn onto westbound Chambers Street, and struck Ms. Cook, who was riding north along the Hudson River Park Greenway. Olga Cook,the 30-year-old newlywed and triathlete who was killed by a drunk driver while cycling in Battery Park City on June 11, 2016. "There were 17 prior crashes at just this location, in the years preceding Olga's death," says attorney Daniel Flanzig, who is representing Ms. Cook's husband, Travis Maclean. "And five of those incidents also resulted in serious injuries. And there have been multiple deaths of cyclists at other locations in the Hudson River Park's bike path." Important type of insurance coverage that cyclists should have, besides their own health insurance, is the UM/UIM coverage on their automobile insurance policy. The most important type of coverage that cyclists should have, besides their own health insurance, is the UM/UIM coverage on their automobile insurance policy. Yep, that's right, your auto policy provides protection for YOU in case you are hit by an uninsured or underinsured driver, including a hit and run driver. This protection, called "UM/UIM" coverage, protects you if you are hit by another driver who is uninsured (that's the "UM" in the coverage). Your UM coverage also means you're covered in a hit and run. You're also covered if you're hit by an underinsured driver (that's the "UIM" in the coverage). This part of your policy covers you if the driver who hit you is insured, but for less than is necessary to cover payment for your injuries. For example, in some states, "contact" may be required for your UM/UIM coverage to kick in. So if you were actually hit by the driver who left crossed you, your UM/UIM coverage can kick in as needed. If the driver caused you to crash without actually making contact, you're not going to be able to use your UM/UIM coverage. Again, this is not the law in every state, but it's something you should ask your insurance agent about. 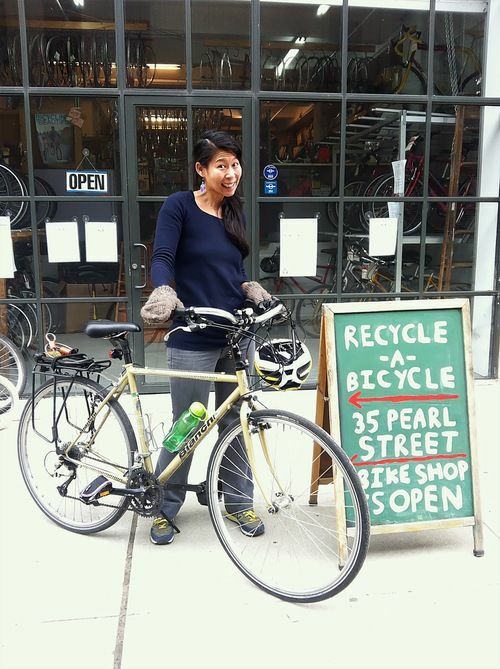 Eleanor's NYC's profile of Helen Shirley Ho of recycle-a-bicycle, New York. Joe Cruz's beautiful bike tours. More Blacks and Hispanics thought bicyclists were mostly women, children, and seniors and more Blacks and Hispanics thought they would bike more if they could bike with family and friends. To comfortably bicycle with someone, the bicyclist would prefer to ride beside and not in front or behind their companion. Therefore, cycle tracks in lower income ethnic-minority neighborhoods should be wide to enable side-by-side riding with family and friends. (C.R.O.W, 2006 ; Rietveld and Daniel, 2004). North Shore Racks customer testimonials and Series 202 racks. Citibike plan for Astoria and Long Island City, 2017. But the biggest flaws with e-bikes are physical and psychological. The bicycle is meant to be an endorphin-multiplier. In my mind, bike commuting's big draw is burning calories on the way to your destination. Yes, an e-bike is better for the environment than your car, but in the end, you forgo a crucial part of the experience. You make yourself better, and stronger, when you ride a real bike. An insurance bill for damage to the vehicle that hit her ? For the first time in her life, Nako Nakatsuka felt hopeless. On April 6, 2014, the typically upbeat biochemistry grad student and member of the UCLA triathlon team had been making a left turn off Santa Monica Boulevard on her road bike when a car drifted into the turn lane and hit her from behind. But it wasn't the crash that got to her--it was what came in the mail a month later: an insurance bill for damage to the vehicle that hit her, along with the threat of a lawsuit. Ride Body Float and Cane Creek Thudbuster. Manhattan to Montreal bike path. Thanks Cuomo ! Governor Andrew M. Cuomo today proposed completing the Hudson River Valley Greenway and Erie Canalway trails by 2020 to create the Empire State Trail, the largest state multi-use trail in the nation. To achieve this, the state will develop 350 miles of new trail in three phases to create a 750-mile pathway for hiking and biking along scenic vistas and through charming, historic communities. The Empire State Trail will span much of the state, from the New York Harbor up through the Adirondack Mountains to the Canadian border - and from the shores of Lake Erie along the historic Erie Canal to the heart of the Capital Region. Times-up organized some bike rides in NYC. A long term review is of the Wahoo Element coming, but initial impressions are good. Pros: form factor, features, moderately reliable bluetooth syncing, uploading to Strava. Cons: instruction in box very lacking, mounting hardware for tapperred handlebars, battery life, backlighting at night. Freewheel Bike's Wheelbike Fat Bike Everything. Growing bicycle niche of all terrain fat-tire bicycles. city, state and federal policies that for more than half a century encouraged suburbanization and car use -- from mortgage lending to road building -- are gradually being diluted or reversed. "They created what I call a culture of 'automobility,' and arguably in the last 5 to 10 years that is dying out," Ms. Sheller said. New York's new bike-sharing program and its skyrocketing bridge and tunnel tolls reflect those new priorities, as do a proliferation of car-sharing programs across the nation. A study last year found that driving by young people decreased 23 percent between 2001 and 2009. The millennials don't value cars and car ownership, they value technology -- they care about what kinds of devices you own, Ms. Sheller said. The percentage of young drivers is inversely related to the availability of the Internet, Mr. Sivak's research has found. Why spend an hour driving to work when you could take the bus or train and be online? From 2007 to 2011, the age group most likely to buy a car shifted from the 35 to 44 group to the 55 to 64 group, he found. Looking forward to system data and realtime updated maps. Already two weeks in service, it looks popular and very useful. Posted to Green transit urbanism NY. Dorothy Rabinowitz of The Wall Street Journal called the Bloomberg administration "totalitarian" for ... encouraging the riding of bikes. In perhaps the best unhinged rant of any kind ever, Daniel Greenfield at the always enjoyable FrontPage Magazine refers to Janette Sadik-Khan, the city's pro-bike transportation chief, as a "Muslim Nazi collaborator's granddaughter" who in "partial revenge ... made many New York streets nearly as impassable as those of her grandfather's wartime Dresden." 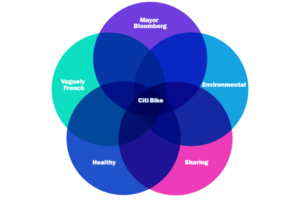 NY Mag's intelligencer CitiBike NYC venn-diagram: why-conservatives-hate-citi-bike. Sharing: So central to the concept of bike shares, they put it right in the name. But conservatives hate sharing -- tax dollars, calamari, doesn't matter. True story: Louie Gohmert never shared a toy for the duration of his childhood. It is a very slippery slope from sharing bikes to sharing everything. You blink and all of a sudden we're a socialist dystopia, and everyone's eating Bloomberg Vitamin Mush for every meal. Environmental: Bike are also good for the environment. This will please you if you think the environment actually needs help. But if you think carbon emissions and climate change are conspiracies (like 58 percent of Republicans) perpetrated by Al Gore and a handful of scientists at the University of East Anglia, then bikes are just lies on wheels. Vaguely French: French people ride bikes, right? Like, more than other people? There's something vaguely French about this whole thing. Doesn't sit well.